I have been a search evangelist since the early 2000s. I pride myself and Calibrate on having a proven process on getting your company found in the top of the search engine results. After signing with Calibrate at the beginning of 2017, one of the first initiatives we started was fixing the low hanging fruit in their SEO. They needed a page title refresh, META descriptions, SSL, keyword strategy and plenty of new content. The content, and ongoing SEO, are part of what we do on a monthly basis. We also monitor the success in monthly reports and spreadsheets so that we can pivot as necessary. In this deal, the first visit to our client's site came from a Google search, unfortunately from an unknown query. As you know, Google started stripping the keyword data out of the results they give us years ago. It is a little frustrating as it would be nice to be able to track this data and leverage high converting terms, but that was not the case. Now that we had seen nearly double digit growth in organic traffic in six months, it was time to build solid landing pages to take prospects from the top of the sales funnel, to the middle. After having many meetings with the client we looked for opportunities where they manually processed leads and nurtured prospects. A product catalog was a marketers dream, after all they were emailing them regularly and HubSpot automation could handle this very easily. The next question we asked, "is there anything else you send prospects to let them touch and feel your product?" And there was. In fact a fabulous product sample, with product specs and something that could be mailed very easily. We built another landing page for prospective customers to order these sample products and those conversions were pushing these visitors further and further down the sales funnel. Over the year we built many other landing pages with white papers and other gated content but for the sake of this win, let's talk about how we used Inbound and HubSpot to nurture this prospect. Now that our landing pages were in place, it was workflows that would nearly eliminate the work of the client's sales teams, and let HubSpot do it's job. In this particular case, their product catalog was an immediate download, with a follow up email. We did not need to mail anything. So we created a workflow that added a 3 day delay after the download, then we sent them an email for a free sample of their products. If they did not respond or open that email, we sent it again a few days later. If they said yes and requested the samples, we gave them options of exactly which samples they wanted and they were bulk mailed every Friday. Then about 7 days later, a task was assigned to a sales person at our client's company to follow up with the prospect. Did you like our samples? Do you have any questions? Remember, a sales person had not even been involved up until this point, HubSpot was our sales person! It didn't stop there. Since we knew the visitor and knew what they were reading, we were able to setup thresholds when they read certain pages over a selected amount of visits, it was time to offer them product samples. Once again, this was all completed through lists and workflows in HubSpot. 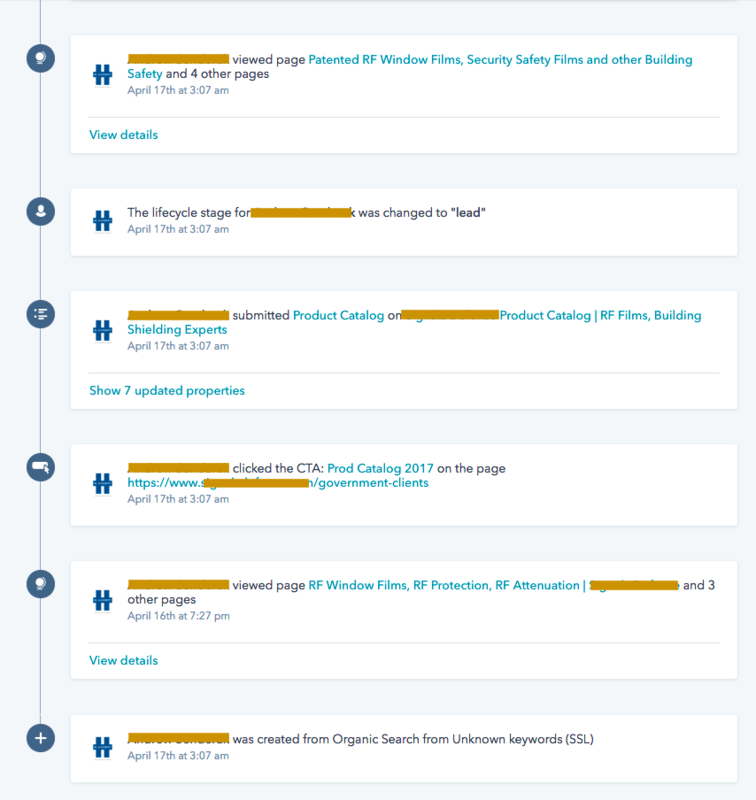 During this entire process, HubSpot's FREE CRM tool was tracking all of the transactions between their website and this new prospect. When he returned to the site, the pages he read, the forms he completed, the emails he read and now it was time to not only call and close this deal, but use CRM to finish the project. This is ultimately the power of HubSpot and it's breadth of products and services. It's all encompassing. From the SEO foundation, from the website touches, the the landing pages and workflows and then ultimately to a closed deal in their very powerful CRM tool. This is just one example of the wins we have had this year with this client and others. We would love to have you be our next success story.